By LUDWIG VON KOOPA - You think it's corporate manure, but it's the TRUTH. In the span of two weeks, Nintendo has revived two sequels that were thought to either be dead or aborted: First, Metroid II: Return of Samus was revived from the dead as Metroid: Samus Returns for the 3DS, releasing this September 2017. Second, Star Fox 2, after sitting finished but unreleased anywhere in the world for 22 years, is releasing this September 2017 as part of the Super Nintendo Entertainment System: SNES Classic Edition. “[Question:] People Making Nintendo Emulators and Nintendo ROMs are Helping Publishers by Making Old Games Available that are No Longer Being Sold by the Copyright Owner. This Does Not Hurt Anyone and Allows Gamers to Play Old Favorites. What's the Problem? I like how they have the person asking the stupid questions throughout that page portrayed as the kind of person who capitalises every word in a sentence, like some of the freaks you sometimes can find on Miiverse. Anyway, look at the emphasis. The assumption that Nintendo will never do anything with a Metroid II or Star Fox 2 or MOTHER 2 or any number of other titles is simply incorrect. They can do whatever they want and whenever they want, because they are the exclusive rights holders to their intellectual property. You're breaking the law if you try to undermine that. It's good to wait. A comparison of Metroid II efforts. 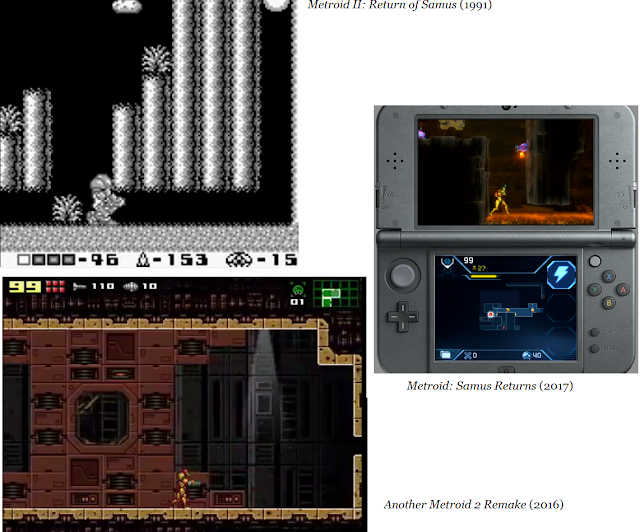 I've written previously about a fan-developed remake of Metroid II, called Another Metroid 2 Remake, or AM2R. It was obliterated from distribution channels via a Digital Millennium Copyright Act (DMCA) request by Nintendo after it was finally released, after many years of development. It was supported by many fans on the premise that Nintendo would never touch Metroid II ever again, so what's the harm of taking things into your own hands? I can't say for sure which game will be better between AM2R and Metroid: Samus Returns. One has the love of a fan behind it, while the other actually gets the series director (who didn't direct the original) and millions of dollars of budget behind it. Both approaches will bring different perspectives, but neither is a straight-up remastering of the game. Both have lots of new features that may be controversial to some group of fans out there. One replaces the II with a 2, and the other doesn't bother putting a number. Maybe the fact that Metroid: Samus Returns will have Melee Counters will give people Metroid: Other M triggers and they'll be very unhappy. Who knows. I don't. All I know is that fan projects are like “extra credit” and people treat official games to be the main “test”. Not that the extra (sometimes unwarranted) scrutiny should scare away developers from using their own intellectual property. It's not a good company strategy to be afraid of what the fans will think and leave franchise development up to the fans. You don't have to shut their project down, but... if you want to, sure. The lesson at the end of the day is that the piracy excuse of “well, they're never going to bring this old game back and sell it again, so I'll just steal it since they won't ever profit ever again from it anyway” is a total lie. Give anyone making that excuse this article. Ludwig almost wrote “Nintendo Brings Dead Gamers Back to Life” as the article title, which would be a very bad typo to make. This article was inspired by a request made on the KoopaTV Requests page, and you should take advantage of that page! Meanwhile, the KoopaTV Loyalty Rewards Program Round 14 ends in 48 hours after this is published. You can get lots of points by doing things with KoopaTV's own games, provided they don't get shut down, too. Given Nintendo's stance here, is what they're doing with fan games the best thing they can do for their business? So what are your thoughts about Star Fox 2 being kept hostage in the scalpers paradise? ...oh. Well, I guess everyone expects that to happen. Here is what might end up happening: A few years from now, perhaps 2 to 4, Star Fox 2 will be re-released digitally on the Nintendo Switch or whatever. For now, yes, scalpers' paradise, but that's not different than the days where digital releases didn't exist. I haven't played the original Metroid II OR its fan-made game. Can... you tell from the article? I did watch a playthrough of Metroid II a long time ago. It's awful watching material, though, and the best I can remember from it is that the music isn't... music. I listened to some of AM2R's music after I wrote this article and it's actually pretty nice stuff! I will say, by definition, Federation Force is “a breath of fresh air”. Well I found out that Wargroove has harpy units so I am satisfied for now.